Beitar Illit (Hebrew: בֵּיתָר עִלִּית; officially Betar Illit; "Illit" is pronounced "ee-leet"; Arabic: بيتار عيليت‎) is an Israeli settlement organized as a city in Gush Etzion, 10 kilometres (6.2 mi) south of Jerusalem, in the Judaean Mountains of the West Bank. Beitar Illit is one of Israel's largest and most rapidly growing settlements, and in 2017 had a population of 54,557. Hachnasat Sefer Torah to the Boston synagogue in Beitar Illit. Beitar Illit, (lit. Upper Beitar) is named after the ancient Jewish city of Betar, whose ruins lie 1 kilometre (0.62 mi) away. According to ARIJ, Beitar Illit was established in 1985 on land which Israel had confiscated from two nearby Palestinian villages; 3140 dunams were taken from Husan while 1166 dunams were taken from Nahalin. It was established by a small group of young families from the religious Zionist yeshiva of Machon Meir. The first residents moved in, in 1990. As Beitar Illit began to grow, an influx of Haredi Jewish Bobover families came to predominate, while the original group moved on. The city is now home to many Hasidic groups, including Bobov, Boston, Boyan, Breslov, Karlin-Stolin and Slonim. The city has expanded to three adjacent hills. Beitar Illit lies in the northern Judean Hills at about 700 m above sea level. It is located just west of the intersection of Route 60, the north–south artery which roughly follows the watershed from Nazareth through Jerusalem to Beersheba, and Route 375, which descends west into the Elah Valley to the coastal plain and Tel Aviv area. It takes about 10 minutes to get to Jerusalem; Tel Aviv is around 60 minutes away. Beitar Illit is connected to West Jerusalem by the Tunnels Highway, which passes directly underneath the Arab town of Beit Jala and allows access to Jerusalem without coming within view of Arabs. At the end of 2003, the population was 23,000 and in 2006 it was 29,100. According to statistics from the Ministry of the Interior, the population in January 2007 was 35,000, an increase of 20% over one year. A Ministry of Interior report from July 2013 placed the population at 45,710. With an annual birth rate of 1,800 births, Beitar Illit has the fastest population growth among the West Bank settlements. Approximately 63 percent of the population is under the age of 18, which is the highest percentage of children in any Israeli settlement or city. According to local authorities the population may reach 100,000 by 2020, based on population growth and the building of new apartments to attract more Haredim from Bnei Brak and Jerusalem. The population of Beitar Illit is 100% Haredi. Approximately 50% of the population is Hasidic. An estimated 10 percent of the population is English-speaking. There are three English-speaking synagogues, two English-speaking kollels (one for retirees), and an English-speaking women's group. All incoming residents are screened by an acceptance committee. As the population of Beitar Illit is Haredi, the schools are all Haredi schools. The city has close to 20,000 schoolchildren. Of these, approximately 6,000 are enrolled in the city's 225 preschools and daycare centers. Elementary school-age boys attend the city's 27 Talmud Torahs, and elementary school-age girls attend 18 elementary schools. Secondary education includes 21 yeshivas for boys and 11 high schools and post-high schools for girls. Married adult men study in 75 kollels. A significant number of men work, mostly at home or in Jerusalem. Women are employed by local business process outsourcing companies that accommodate the Haredi lifestyle, such as Greenpoint, Matrix, and CityBook. In 2010, it was reported that 64.3% of working-age men and 45.8% of working-age women in Beitar Illit were unemployed. One hundred and forty synagogues and 15 mikvehs serve the population. Beitar Illit has been awarded the Israel Ministry of Interior's gold prize, recognizing "responsible management and sustainable urban planning", for eight years running. In 2002, it received the Ministry of Interior's prize for water conservation in public gardens, urban public institutions, and urban water administration. The municipal welfare department was awarded a prize and recognized by the national government as an "outstanding department" for its work in preventing teen dropouts. The city is well known for its landscaping and general cleanliness. There are 94 parks and hundreds of playgrounds in the city. From 2000 to 2013, Beitar Illit earned five out of five stars in the Council for a Beautiful Israel's annual "Beautiful Town in a Beautiful Israel" contest, which recognizes a city's investment in environment, aesthetics, and maintenance of appearance and cleanliness. In 2005 the city won the Council for a Beautiful Israel's "Beauty Flag", which is awarded every five years. 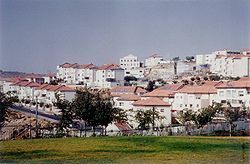 Like all settlements in the Israeli-occupied territories, Beitar Illit is considered illegal under international law, though Israel disputes this. The international community considers Israeli settlements to violate the Fourth Geneva Convention's prohibition on the transfer of an occupying power's civilian population into occupied territory. The Israeli government disputes that the Fourth Geneva Convention applies to the Palestinian territories as they had not been legally held by a sovereign prior to Israel taking control of them. This view has been rejected by the International Court of Justice and the International Committee of the Red Cross. At an international conference in Karlsruhe in November 2010, Jawad Hasan claimed that sewage and urban runoff from Beitar Illit have contaminated the local hydrological system. The Palestinian Authority claims that sewage flows into neighboring Palestinian fields and orchards. Farmers from Wadi Fukin have complained that since the establishment of Beitar Illit in 1985, 11 natural wells have gone dry and they have suffered from overflow from the settlement's backed up sewers. The Israeli government has ordered Beitar Illit to address these sewage problems. In 2010, the Israeli interior ministry announced plans to build 112 new apartments during a visit by U.S. vice-president Joe Biden, leading to widespread news coverage that embarrassed the Israeli government. Beitar Illit was one of four cities named in a petition to the Israeli High Court in December 2010 alleging a pattern of discrimination against Sephardi girls in the local Haredi schools. A Beitar Illit spokesman denied the charges, stating that the percentage of Sephardi girls in the school matched the percentage of Sephardim in the settlement. Battir, an Arab village adjacent to Beitar Illit and the Betar ruins. ^ a b "City: Beitar Illit". Govisitisrael.com. Archived from the original on 11 July 2011. Retrieved 2011-07-19. ^ "Environmental Peacebuilding Theory and Practice A Case Study of the Good Water Neighbours Project and In Depth Analysis of the Wadi Fukin / Tzur Hadassah Communities" (PDF). EcoPeace/Friends of the Earth. January 2008. pp. 29–35. Archived (PDF) from the original on 24 July 2011. Retrieved 19 July 2011. ^ Joshua Mitnick (October 15, 2010). "Israeli settlement building surges as US pushes for a new freeze". Christian Science Monitor. Retrieved August 21, 2012. ^ "US denies Israel settlement move violates moratorium". BBC. March 8, 2010. Retrieved August 21, 2012. ^ a b "EU chides Israel over new West Bank settlement homes". Agence France-Presse. July 19, 2011. Retrieved August 21, 2012. ^ a b "Israel to build 336 new West Bank settlement homes". Agence France-Presse. July 18, 2011. ^ a b c d e f g h i j k Tzoren, Moshe Michael. "Some Talk Peace, Others Live It". Hamodia Israel News, November 21, 2018, pp. A18-A19. ^ John Collins (Fall 2008). "Dromocratic Palestine". Middle East Report (248): 8–13. JSTOR 25164857. ^ a b Paul Rivlin (15 November 2010). The Israeli Economy from the Foundation of the State through the 21st Century. Cambridge University Press. p. 169. ISBN 978-0-521-19037-4. Retrieved 22 August 2012. ^ הודעה בדבר קביעת מספר חברי המועצה במועצות מקומיות [Notice Regarding the Assignment of Council Members in Regional Councils] (PDF) (in Hebrew). Israel Ministry of Interior. 18 July 2013. Archived from the original (PDF) on 29 October 2013. Retrieved 14 December 2013. ^ Shragai, Nadav (August 14, 2007). "Ultra-Orthodox Jews deliver a population boom to the West Bank". Haaretz. Retrieved August 22, 2012. ^ "Beitar Illit". torahalive.com. Retrieved 14 December 2013. ^ a b c d "Beitar Illit". Nefesh B'Nefesh. October 2010. Retrieved 14 December 2013. ^ Jawad Hasan; Amer Marie; Haneen Froukh (2010). "Watershed Management Under Terms of Depletive Water Balance and High Vulnerability in Wadi Fuqeen: West Bank Palestine". Integrated water resources management Karlsruhe 2010 : international conference, 24 - 25 November 2010; conference proceedings. KIT Scientific Publishing. pp. 50–6. ISBN 978-3-86644-545-1. Retrieved 21 August 2012. ^ "Settlers Drown Palestinians' Land with Wastewater in Bethlehem". Wafa. 29 May 2011. Archived from the original on 1 June 2011. Retrieved 19 July 2011. ^ "Palestinian village and Israeli town build rare partnership across line". Jewish Journal of Greater Los Angeles. April 20, 2010. Retrieved August 22, 2012. ^ "Israel sorry for announcing homes plan during Biden visit". Guardian Unlimited. March 10, 2010. Retrieved August 21, 2012. ^ Jeremy Sharon (January 11, 2011). "Court postpones ruling on haredi school discrimination petition". Jerusalem Post. Retrieved August 21, 2012. Ethan Bronner and Isabel Kershner (July 26, 2009). "In West Bank Settlements, Sign of Hope for a Deal". New York Times. Retrieved August 21, 2012. Wikimedia Commons has media related to Beitar Ilit.